The biggest party in the NFL can be found in “The Big Easy,” aka New Orleans, home of the Saints. Fans can start out tailgating in the French Quarter and then move towards the Superdome for a Saints game. The Superdome has been the home to some of the biggest events in sports including seven Super Bowls, number college football championship games and home of the New Orleans Saints since 1975. In the mid 1960s, New Orleans businessman Dave Dixon envisioned a domed stadium that could bring a football team to the area. Dixon’s vision soon became a reality. After much discussion and planning, the Louisiana Legislature passed a bill that allowed the stadium to be built on November 8, 1966. After reaching an agreement to build a stadium, the NFL awarded the area a team, the New Orleans Saints. Construction began in August 1971 and was completed by August 1975. Due to its massive size, the dome stadium was named the Louisiana Superdome. The Superdome covers 13 acres and is 27 stories tall. From the outside it looks like a massive spaceship. The New Orleans Saints played their first game at the Superdome on September 28, 1975 against the Cincinnati Bengals. Almost 70,000 multicolored seats divided into three tiers, circle the entire field at the Superdome. Every seat next to another one is a different color, making it seem like more people are at the stadium. Several video/scoreboards are located inside the Superdome. During the summer of 1996, the Superdome underwent a $22.8 million renovation project that included a new entrance lobby and ticket offices, an additional concourse serving the upper level seats, refurbished ballrooms, additional accommodations for the disabled and upgraded safety and security equipment. After the 2002 season, the Astroturf playing field was replaced with Fieldturf. The Superdome hosts numerous other events other than football including baseball and basketball games, trade shows, conventions, concerts, and many other events. It has also hosted seven Super Bowls and will host its eighth Super Bowl in 2024. Drew Brees passes for 5,069 yards in 2008. George Rogers rushes for 1,674 yards in 1981. In August 2005, the Superdome was the shelter for more than 30,000 residents during Hurricane Katrina. The hurricane sheared away much of the roof’s covering and water leaked into the stadium as it was used as a shelter for thousands of stranded residents. 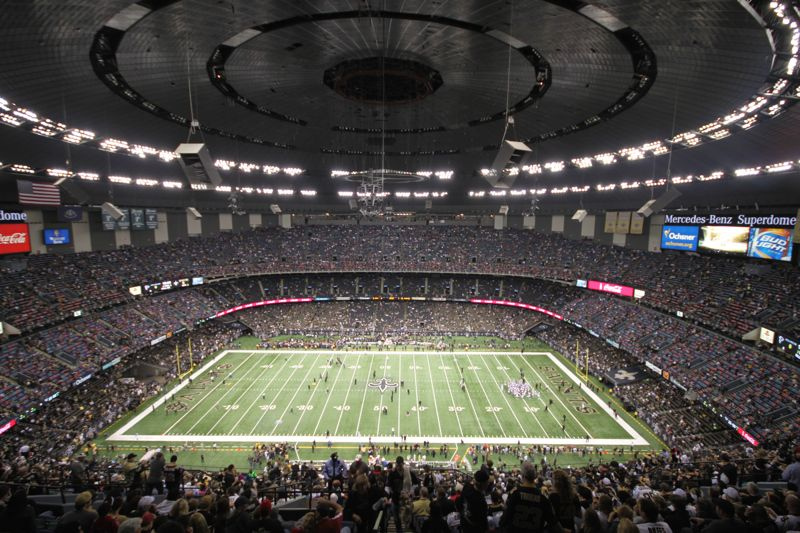 The Superdome sustained $185.4 million in damage and the New Orleans Saints played their 2005 home games in San Antonio at the Alamodome and in Baton Rouge at Tiger Stadium. In January 2006 work began to clean up and renovate the Superdome. Nearly 4,000 tons of trash and debris were removed, along with 1.6 million square feet of wrecked carpeting, 650,000 square feet of wall board and 500,000 square feet of ceiling tiles. All 72,000 seats were cleaned and crews repaired the roof. The 30 year old stadium’s three-level seating plan remains the same, with the most noticeable difference being a thin video board, called a ribbon board, replacing the facade of the upper deck. Scoreboard video screens behind each end zone have been enlarged. The New Orleans Saints played their first game in the city since 2004 on September 24, 2006 against the Atlanta Falcons. 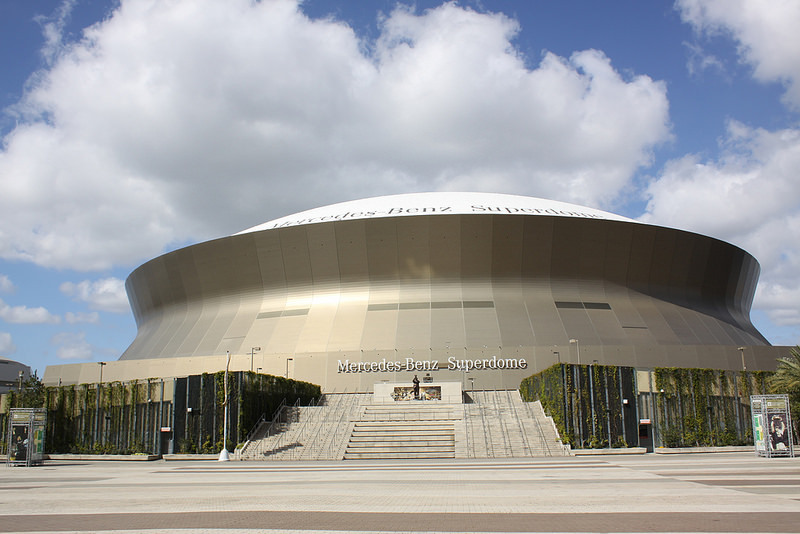 In April 2009, the Saints and the State of Louisiana reached an agreement to keep the franchise at the Superdome through 2025. The agreement included upgrading the Superdome and resurrecting an abandoned section of the Central Business District with a refurbished office tower and a new sports entertainment district. Improvements to the Superdome included widening plaza level concourses, adding concession stands, re-configuring the lower bowl that adds 3,100 seats, adding 300-level luxury suites, a new retail store, a club lounge and upgraded restaurants. The $210 million renovation project was completed during the 2010 and 2011 off-seasons and increased the seating capacity from 72,000 to 76,468. In October 2011 Mercedes-Benz purchased the naming rights for 10 years to the dome and it is know known as the Mercedes-Benz Superdome.